Freedom and Flourishing: What does economics tell us about making New Year's resolutions? What does economics tell us about making New Year's resolutions? Opportunity cost was the first thing that came to mind the other day after the thought occurred that I should perhaps consider making a New Year’s resolution. That was probably because I just happened to be paying attention on the day the concept of opportunity cost was explained when I was at university many years ago. Opportunity cost is just a label. If you haven’t had the benefit of studying economics you might still be aware that the time and effort you spend making resolutions and trying to keep them could possibly be spent doing something more enjoyable. You may also be aware that there are emotional costs associated with making resolutions and then failing to keep them. On the other hand, by now some of you will be thinking that opportunity costs are just excuses for inaction. You might want to urge me to consider the potential satisfaction of making resolutions that might enable me to become a healthier or better person. That is why my mind now turns to the law of diminishing marginal utility. That law says, more or less, that as you obtain more of any good, the additional happiness you obtain from each additional unit tends to diminish. Every wine drinker should know that a larger increment of happiness is likely to be obtained from the first glass of wine than from the second, and a larger increment of happiness from the second than from the third, and so on. If the truth of that observation is not obvious to you on New Year’s eve, it might well become very obvious on New Year’s day. It seems to me that the law of diminishing marginal utility applies to New Year’s resolutions in much the same way as to other goods. For example, a person who swears a great deal might gain some satisfaction if she can refrain from using foul language in the presence of children. The further increment she obtains from refraining from swearing in front of people whom she knows to be disgusted by the behaviour, might be somewhat smaller. The increments in satisfaction could be expected to become progressively smaller as she adds further classes of people or situations. All this brings to mind the image of a scissors diagram, regarded as a thing of great beauty by many economists of my vintage. The downward sloping line in the diagram below represents the declining marginal utility of resolutions and the upward sloping lines represent the rising marginal cost of resolutions (expressed in utility terms). If you are having difficulty viewing the quantity of resolutions as a homogenous good, think of the horizontal axis as measuring the extent to which you might consider reducing your use of a particular swear word over the next year. I have drawn two cost curves in the diagram to illustrate how the optimal investment in resolutions would change if it became less costly to make and keep resolutions. The initial optimum is at point A, where our subject makes a relatively small investment in New Year’s resolutions. 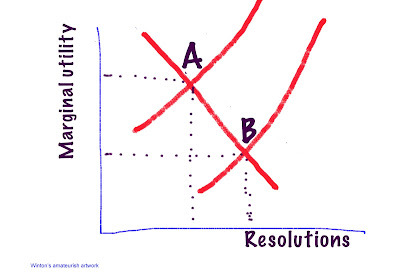 If it became less costly to make resolutions, the optimum would move to point B. At that point she would make more resolutions - and her total utility would be higher. So, what does economics have to tell us about how to reduce the costs associated with New Year’s resolutions? An obvious place to look is behavioral economics. It is not difficult to find articles on the internet suggesting how we can use behavioral economics to help us to stick to our resolutions. Much of the underlying research is more in the field of psychology than economics, such as the work of Roy Baumeister on willpower (which I discussed here). In my view the area of economics that has most potential to help us to understand and reduce the costs associated with making and keeping resolutions is ‘identity economics’. The key idea of identity economics – as explained in a book of that name by George Akerlof and Rachel Kranton - is that individuals gain satisfaction when their actions conform to the norms and ideals of their identity. In the way Kranton and Akerlof develop the concept, identity is determined to a large extent by the groups to which individuals belong. However, when you think about your own identity, as an autonomous individual, you are free to think of it as being defined by the qualities you value most highly - or identify with. (There is some relevant discussion in a recent post in which I reviewed Russ Harris’s book, The Happiness Trap.) Recent research by Anthony Burrow and Nathan Spreng, which suggests that having a purpose in life tends to impede impulsivity, points to the potential benefits of keeping in mind the qualities we value most highly. This brings to mind the potential to draw a possibilities diagram showing trade-offs between some of the things I value. On one axis is excellence and on the other axis is tranquility. I will leave it to your imagination. On reflection, it doesn’t seem to make much sense to think in terms of trade-offs between excellence and tranquility. 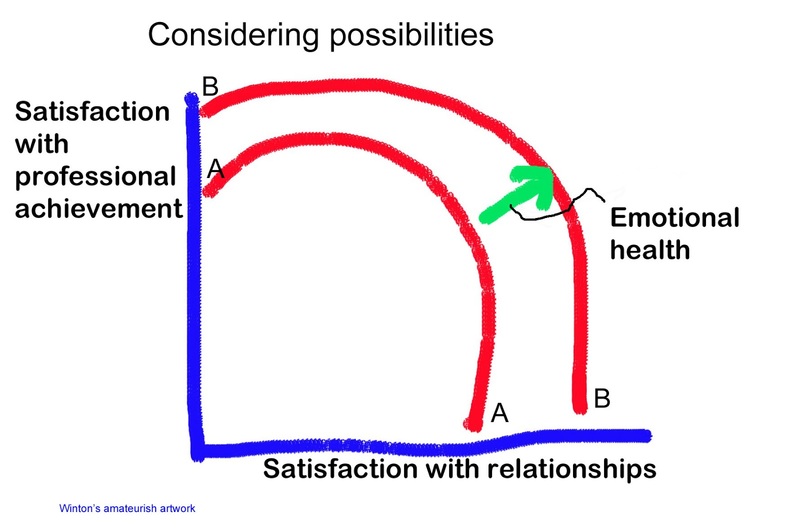 It might make more sense to think in terms of a trade-off between satisfaction with professional achievement and satisfaction with relationships, as shown below. 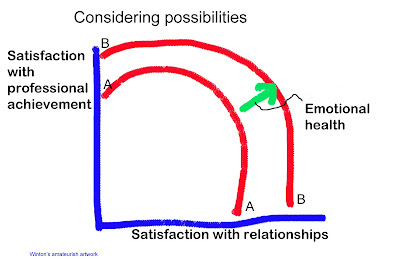 An investment in emotional health might expand the possibilities available. Why wish everyone a Merry Christmas? How can we avoid the happiness trap?